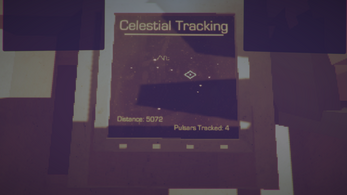 This is a game about navigating the stars. Track pulsars, and tunnel through the bulk using wormholes. You aren't alone, your partner is there to keep you company. Submitted for the Fermi Paradox game jam, hosted by Loren Schmidt and Katie Rose. I put a lot into developing this one, it took me right until the very end to piece it together into what it is but I'm happy with how far along it came. I'd like to polish it up some more when I get the chance. Some things are currently missing that I'd love to have in, and I think the main mechanics can be a bit overwhelming. If you liked it get in touch via twitter @CriticalMammal and consider dropping a donation. 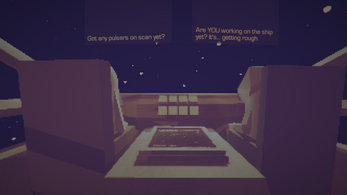 Fixed a bug where the dialogue windows would get out of sync with the camera position. Changed controls text to more clearly display (spacebar) when not at the terminal to clarify that all actions happen at the terminal. Removed engine screen in terminal because the mechanics weren't implemented and it served no real purpose. Replaced original music track with a more dynamic version.